Minnesota is a beautiful state to live. But known for its brutal winters, many residents escape to a warmer climate when the temperatures drop. Eric Frost walks you through tips to prepare your home and vehicle for an extended period of absence. ANNA: Hey Eric, we have some clients who are snowbirds in the winter, what advice do you have to prepare their homes while they’re away? ERIC: Sure, that’s a really good question. I think a lot of people in our region and especially in Minnesota do travel for the winter and they are snowbirds, they go to warmer places. The main thing you want to keep in mind is to make your home look like someone is there. You don’t want anyone passing by to know you’re not there for an extended period of time, you know bad things can happen. Some things you can do to help with that are to ask a friend, family member or neighbor to come over, take your mail out of your mailbox, remove your newspapers, get rid of anything on your door like a pamphlet on your door or something. Again, you want it to look like somebody is there. If they are really nice, or you have a really nice family member or friend, they might even clear the snow for you. Maybe not shovel the whole driveway, but if they could at least clear the front of the doorway. Anything like that helps. Also, make sure you have your alarm system active, if you do have a home security system make sure that’s on doors, windows, everything is protected. Your lights – if you have outside lights if they’re on motion sensors and somebody were to walk up to your house your motion sensors would turn on. Your inside lights for the home should be on timers for the nighttime, that’d be great. Again it just looks like somebody is home with the lights going on and off at certain times. Another thing you might want to do is set the temperature in the house. It may not need to be as warm as it is when you’re there but you still want it to be fairly warm so nothing freezes. ANNA: Is there a recommended temperature? ERIC: 55 degrees is the recommended temperature. If you can do a little warmer than that, that’s great. But of course, you’ll pay a little bit of a higher bill for that. 55 degrees is the recommended temperature. ANNA: Okay. Any advice for their auto policy? ERIC: The auto policy depends if you take the vehicle with you. If you take your vehicle with you of course leave your coverage on there so you can drive your vehicle. If you don’t take your vehicle with you and you store it for the winter you can put it on storage coverage. Which just means comprehensive coverage only, you’ll remove the liability because you’re not driving it and you’ll remove the collision coverage. What you’re doing is just covering that vehicle for physical damage while it’s in storage in case something was to fall on it or it’s involved with something scratching it, something like that, then it would be typically a covered claim. 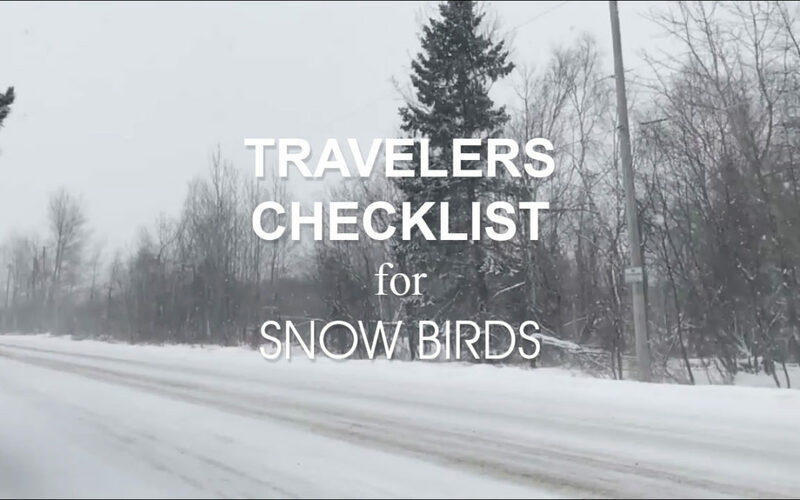 And actually, for those of you out there that are snowbirds, we have a Travelers checklist for snowbirds on our website so if you want to check that out it gives you some really good tips and tricks for when you’re away for the winter. To view the full Travelers Snow Bird Check List, click here. From all of your friends at Hanlon and Associates, happy traveling!